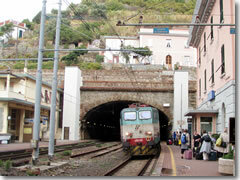 The regional rail line of Le Cinque Terre spends most of its time in tunnels, popping out at the town stations every three minutes or so.Save for the bookend villages (Monterosso al Mare to the north and Riomaggiore to the south), none are easily accessible by car. All, however, are linked by a regional rail line that spends most of its time tunneling from town to town through the sea cliffs (providing great peek-a-boo views). The villages are quite close together; train rides between any two neighboring towns only take 3 minutes—figure on as much as 12 to get between non-neighboring towns, and up 20 minutes if you take the slow train all the way from one end to the other (though there's also an express train that skips the three intermediate villages and makes the trip in 7 minutes). One-way train tickets between any two Cinque Terre towns cost €1.40 to €1.80, and are valid for six hours. There is also now a batello ferry (tel. +39-0187-732-987; www.navigazionegolfodeipoeti.it), with sailings roughly once an hour between 9am and 12:30pm plus a few afternoon sailings between 2pm and 4pm. The Cinque Terre ferry stops in Monterosso, Vernazza, and Riomaggiore. Tickets range from €5 to €22, see the schedule for an acurate pricing.